The governor said this during a courtesy visit by the new Chief Medical Director (CMD) of the University of Benin Teaching Hospital (UBTH), Dr. Darlington Obaseki, and the hospital’s newly inaugurated management team, to the Government House, Benin City, Edo State. 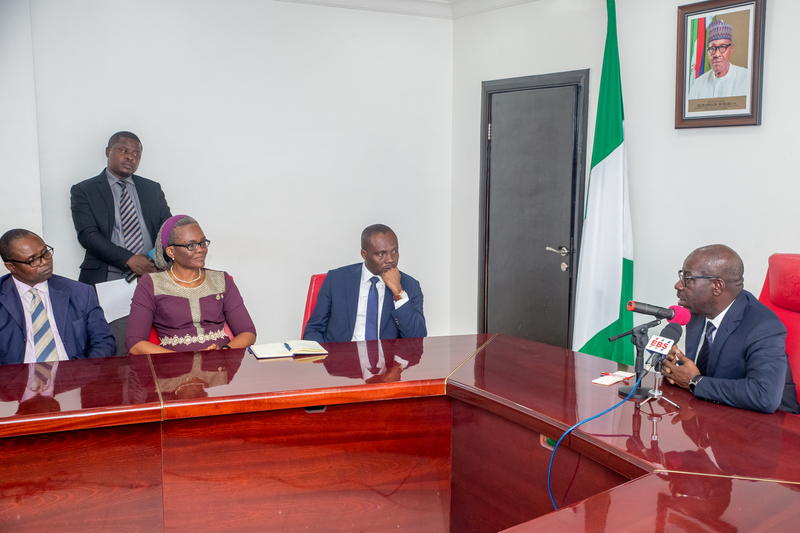 Dr. Obaseki said that the visit was to show appreciation for the governor’s role in ensuring the smooth transition from the previous management of the hospital and initiating a hitherto non-existent cordial relation between the state government and the hospital. Noting that incessant industrial actions plaguing the health sector were a result of inadequate welfare, he urged the state governor to look into the state’s insistence that doctors pay taxes from their core duty allowance. Governor Obaseki said that the commitment to primary health care was due to its impact on the poor masses, as the Edo State needed a strong primary health care system to ensure that residents don’t develop health complications that would limit their chances of contributing to the development of the state. Noting that the challenges in the health sector arose from false assumptions, he said, “We need to revamp our health care system to be relevant and realistic. We need to treat health care as one, it doesn’t matter who owns what. “When this government came on board, we talked about change. We were not joking; it was something fundamental. It is because certain things have changed that is why the burden has been shifted to the hospital. And we need to address these things. And one of the ways to do this is to focus on primary health care,” he said. On the issue of personal income tax for doctors, the governor said that inasmuch as the doctors under the state employ are exempted from the tax, which was granted them by the immediate past administration, those in UBTH should also enjoy the same, noting that a directive would be given to the state’s board of internal revenue to maintain status quo on call duty allowance tax.